Broomhill Art Hotel, Muddiford Road, Barnstaple, EX31 4EX, England. Broomhill Art Hotel now have sixteen images in their collection which are modestly priced. These paintings and prints include recent paintings. 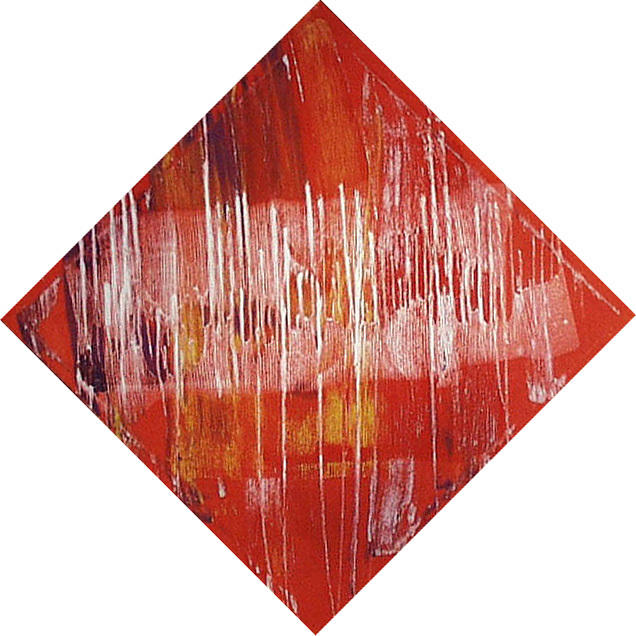 'Cut' -Oil on Canvas 2006 18" x 18"
Broomhill also have three of the images that were exhibited at The Museum of Dartmoor Life in their 'RECYCLE dartmoor' exhibition (15 April until 27 May 2006) these were then exhibited at Beaford Arts . Broomhill's collection also includes lithographs from the 'Allergies 2' solo exhibition (which was at 'The Queen's Theatre' , Barnstaple. 23rd August 2004 - 19th September 2004). 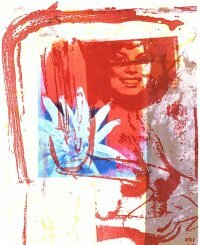 "I began the lithographs in this series in 1978 and completed them in 2004. Over this period of time my life has changed, my body has changed, my politics have changed, my diet has changed etc. Each print is unique and not part of an edition "